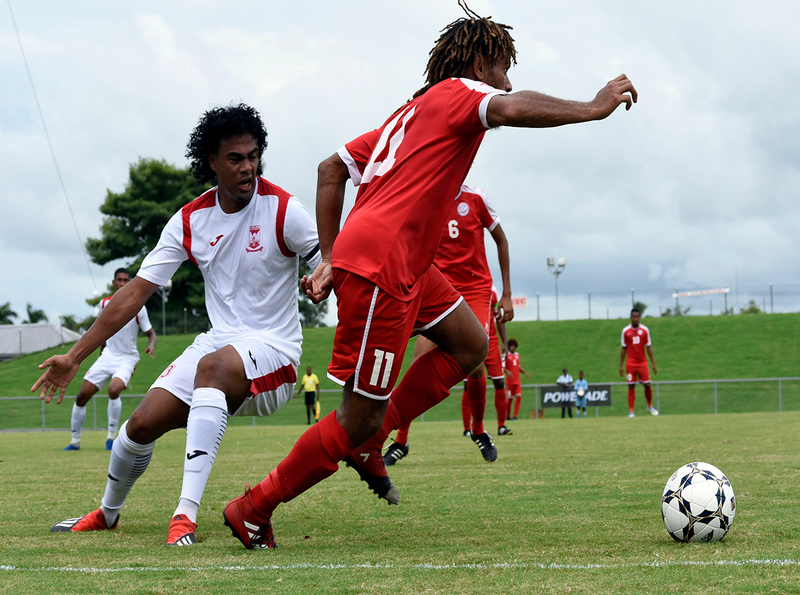 Les Cagous have ended their Three-Nations FIFA International tournament in Fiji with two defeats after going down 3-1 to Mauritius at Lautoka’s Churchill Park. Eager to make amends for their 3-0 loss to Fiji in their opening match, New Caledonia showed plenty of promise against the African team during the early exchanges which paid off in the 24th minute when striker Roy Kayara was fouled inside the penalty box by Mauritius goalkeeper Kevin Obrain Jean-Loius. Referee Salesh Chand didn’t hesitate to point to the spot before Kayara dusting himself off to give his side the lead by blasting past the diving keeper. Sitting two places above Mauritius on the FIFA rankings, Thierry Sardo’s men looked composed and comfortable for the remainder of the first half to maintain their advantage at the break. After the re-start however, the game took a dramatic turn with the Africans taking full control of the proceedings. Mauritius coach Akbar Patel’s decision to send in Adrien Francois in the 50th minute paid dividends just seven minutes later when the striker levelled the scores with a powerful strike from the edge of the box. It got worse for the Pacific Islanders in the 66th minute when Joseph Stephan Kevin Perticots doubled the Dodos advantage before Steven Ashley Nazira sealed the victory for Mauritius in the 73rd minute. Coach Akber Patel has admitted his side was outplayed by New Caledonia in the opening period of the match. “In the first half we did not play well. “We conceded a goal via a penalty but in the second half I made some changes in the team to be more offensive in our attack which paid off,” said Patel. Despite the defeat New Caledonia coach Thiery Sardo said the match was a good preparation for them ahead of the South Pacific Games. “I am happy with the performance of my players despite we lost in both matches partly because we did not have our full squad. “Some of our players are playing overseas and could not make it to the games but their inclusion in the South Pacific Games will help,” Sardo said. Meanwhile Fiji and Mauritius will feature in the final match of the FIFA International Friendly tournament on Sunday. Patel said the match against Fiji would be a tough game. “I have not seen Fiji playing but I know they have beaten New Caledonia 3-0 and must be a good team but we are here for them and would give them a tough game,” insisted the Mauritius coach. Inform Fiji captain Roy Krishna, who joined the national team for their match against Mauritius, also anticipates a keenly contested encounter against the visitors. “It is going to be tough battle as I have seen Mauritius have some quality players but I know my boys are well prepared for the match after a win in the first match. Sunday’s match at Lautoka’s Churchill Park will kick off 3:00 pm.